Our nation is more engaged than ever in debate surrounding the monuments we choose to honor. The stunning violence in Charlottesville, Va. this past weekend was spurred (among other things) by white supremacists fighting to keep a statue of the Confederacy’s top general. Following the rally, officials in Tennessee and Florida announced plans to remove similar monuments. On Monday night in Durham, N.C., dozens of protesters toppled a Confederate statue, then pummeled and spit on the crumpled figure as it lay on the ground. Philly’s no stranger to this discussion – for years, we’ve grappled with calls to remove our front-and-center statue of Frank Rizzo, the notorious former mayor and police commissioner whose legacy includes enacting brutish law enforcement polices that targeted people of color. On Monday, Councilwoman Helen Gym called for the city to remove the statue. All around the country, we're fighting to remove the monuments to slavery & racism. Philly, we have work to do. Take the Rizzo statue down. Rizzo’s statue has stood 10-feet-tall outside City Hall since 1998, seven years after his death. 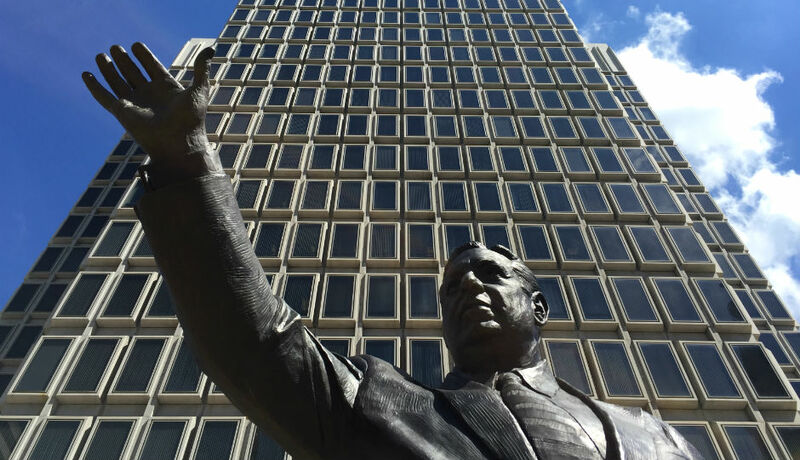 To many, his statue serves only as a reminder of the scars he left on the city’s African-American community and police force, first as police commissioner in the late 1960s and then as mayor in the ’70s. Gym is far from the first to push for the statue’s removal – about a year ago, activists with Black Lives Matter created a petition to remove the monument, calling Rizzo a “racist demagogue.” They rounded up more than a thousand signatures and prompted protests (including one that saw a K.K.K. hood on the statue’s head). But vehement Rizzo fans, including his own grandson, pushed back and created their own petition to keep the statue. In the national debate, many who fight for the preservation of contentious monuments act as if they’re champions of history, often citing the importance of remembering our past – both good or bad. But Gym doesn’t see it quite that way. Gym and others who oppose Rizzo’s statue cite his tainted tenure, including his decision to raid and strip search a group of Black Panthers in front of news crews, multiple reports that he casually and openly called black people the N-word, his advice to “vote white” when pushing for a change in city charter so he could serve a third term as mayor, and other infamous Rizzoisms. Gym said she and other officials have been discussing the statue and that she’s interested in initiating a public process to take it down. City spokesperson Lauren Hitt said it’s a discussion the city is ready to have. “We need to figure out the proper forum for that conversation in a serious, structured way, but now is the right time,” Hitt said. Philly residents are already talking. Probably the very worst big city mayor in American history.